From Hamilton, Ontario, where they formed in 1973 and solidified into the above four piece line-up by 1974. Musically ahead of their time by Canadian standards, they played around the YMCA/high school teen circuit to a reception that ranged from generally indifferent to hostile. The Saucer in their name was derived from the Syd Barrett-era Pink Floyd album Saucerful Of Secrets. This was a big influence on tracks like Mole Machine on side one of the above album. They were also aware of a U.K. group named Just Us, hence Simply Saucer. In July 1974, they headed into a basement recording studio and cut the material which eventually resurfaced 15 years later on the above retrospective release, but never saw the light of day at the time. We're talking a barrage of sound effects, discordant guitars and pace changes. They were considerably influenced by some of the electro-Teuton combos of the period like Can and Faust as well as by the outer-space vernacular of Sun Ra, but they also drew upon The Velvet Underground, The Stooges and Syd Barrett and at times produced that discordant unnerving guitar sound that previews the early Soft Boys. By 1975, Neil DeMerchant had been replaced by a 16 year old boy wonder Tony Cutaia. The second side of the retrospective live album includes material from a free outdoor concert performed on top of a shopping mall in downtown Hamilton. By 1976, the band underwent further personnel changes that saw LaPlante replaced by a second guitarist and the band evolved into a pop/rock outfit that eventually became part of Toronto's new wave scene of 1977/78. In 1978 they cut a 45, She's A Dog/Can Change My Mind, which featured ex-Teenage Head guitarist Steve 'Sparky' Parks. By the end of the decade they had disintegrated. In the late eighties Breau and Christoff formed a new band with some fresh recruits. 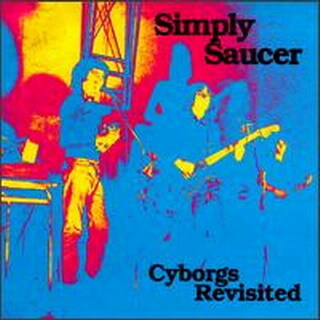 The Cyborgs Revisited album is unusual and certainly worth investigating by fans of psychedelic and electronic music. Originally recorded at MSR Sound (1-5) in July 1974, and live July 1975 (6-9).